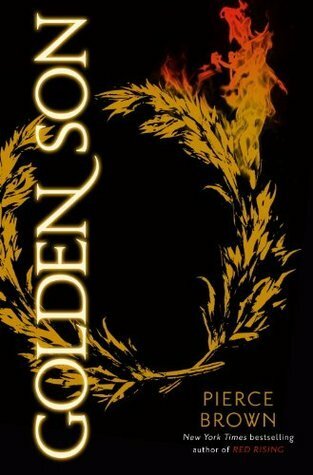 Golden Son is the second novel in the Red Rising trilogy by Pierce Brown. This review may have spoilers for the first book in the series, Red Rising (my review), so read at your own risk. This series is hard to fit into one category, but at its heart it is a sci-fi dystopian novel. I was worried that I wouldn’t enjoy Golden Son because the bit I loved about Red Rising was the relationship between the teams of individuals and the tactics they used in the Institute. However there was no lack of clever tactics in Golden Son, if anything there was more of it. As with the last book, the beginning didn’t really give me enough information to go on. Once I got into the second or third chapter I knew what was going on and was able to truly get into the story. I enjoyed how Darrow’s success in the real world was less wide spread due to his tendency to do things that would not help his reputation. I found that Darrow’s character development in Golden Son helped me to relate to him more. Darrow had more doubts and conflicting goals in this novel which was more realistic. I especially liked how Darrow struggled with the relationships he had with both his friends and rivals. That was something that I could relate to, as he tried to achieve a goal he cared less about how his choices affected others and thus ended up with unhappy friends. The world building continued in Golden Son, and just like I wished we got to meet some characters of other social classes. There was a heavy blue and obsidian presence which was really fun to see, and we got to see a lot more of the world. Golden Son had more of a focus on moral relativity and doing the ‘right’ thing than Red Rising did which I liked. Another plus was that almost all of the characters from the first novel appeared again in Golden Son which was great to see. We did have many more characters introduced, but the novel’s roots weren’t forgotten. It can often be difficult for the second book in a trilogy to keep up the pace. However I thought the plot picked up in Golden Son rather than heading downhill so I have high hopes for the third novel which I aim to get soon. I rate Golden Son a 5 out of 5. I would recommend Golden Son to anyone who enjoyed novels such as Ender’s Game, The Hunger Games and the A Song of Ice and Fire series.